If you follow me on Instagram/Twitter or Facebook you will have already seen a few pictures of me out and about with this stroller, I've had lots of lovely comments asking for more information on it/how I am getting on with it so here I am going to tell you a little bit more. Orbit along with Born have designated me the position of Orbit Brand Ambassador. What this basically means is that we have been given a Orbit G2 to test for six weeks and complete a few challenges along the way. If I get on with the stroller I will be lucky enough to keep it until Wilf has grown out of it and then we will look into options such as donating it for charity. 1. A normal day: Folding the stroller and putting it in your boot. 2. Out & About: Taking the stroller on the Luas / public transport / escalators / airport. 3. Health kick: Taking the Orbit off road e.g. walking on rough terrain / out for a jog. 4. Socialising: Take the Orbit out for coffee with the girls or lunch with the lads. 5. Babysitter / grandparent challenge: Can they dig it? I have had the Orbit now for roughly two weeks, I picked it up from Born where the staff showed me how to assemble it/fold it down again, rotate the seat and attach the panniers (or paninis as I later told Tom..he had a good laugh about that one). The only thing I forgot to ask about was the swivel lock on the wheels so I did walk half way down the street with one front wheel locked and one swivelling like a shopping trolley that only drives in one direction. As soon as I got to the bread shop a little down the road and actually looked at the wheels it was simple to see how to lock/unlock them without looking at any instructions and from there it was smooth riding. Our original pushchair was a Mama's and Papa's Sola. We never really did any pushchair research when I was pregnant as we knew we were going to be getting the Sola second hand from a friend but I knew it was important to me to have one that was could face me rather than outwards. 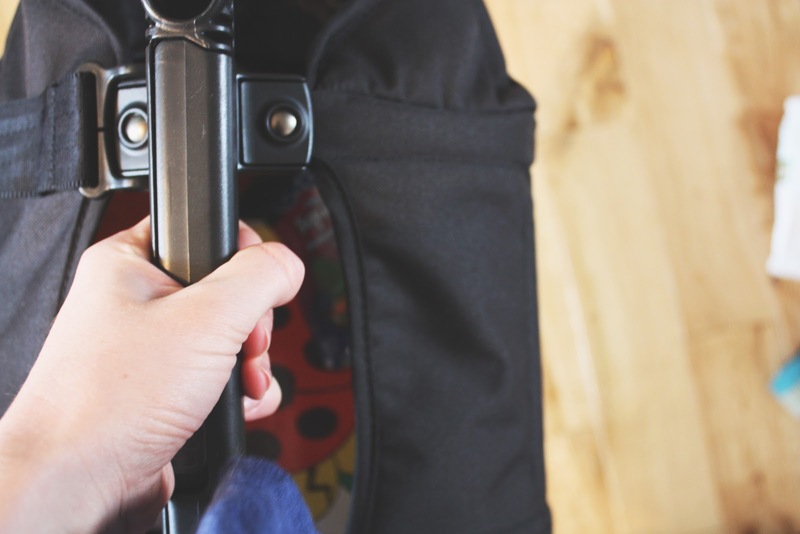 We've really gotten on well with the Sola and found it to be very compact in comparison with other pushchairs but I've never been hugely confident with collapsing it. The first thing I was really impressed with on the Orbit is its incredibly simple to collapse. I've not quite managed the one handed collapse but it is as simple as removing the chair with two clips, then a simple click and twist of the handle and the whole thing collapses very swiftly and compactly. The stroller is stream line which is perfect for city living and also for victorian hallways. Even with both the panniers open its only marginally bigger than our old stroller and with the panniers folded is much slimmer. I would rate the addition of the panniers as one of the best elements of the stoller. 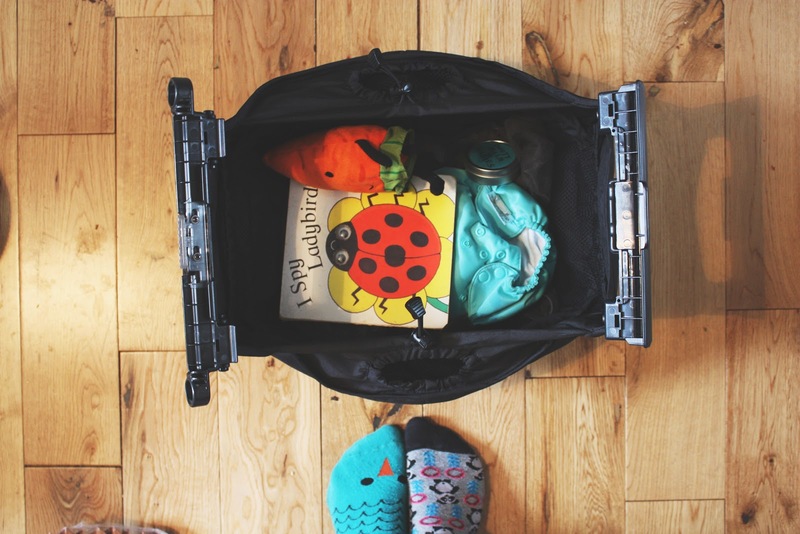 As someone who doesn't drive we are used to cramming our shopping underneath our old stroller, which could fit two bags at a push, (once just before Christmas I didn't balance them right which meant I lost half a wheel of stilton of which I'm still pretty upset about). The top picture shows the pushchair with one of them open, they also come with a water proof cover in case of rain or if you don't want the world to know you just bought a 'Ultimate New York Cheesecake'. The Orbit doesn't come with a huge amount of storage underneath but rather a cargo pod which you can use as a change bag and also to keep the raincover and other little bits in. The lack of space below is more than made up with the storage in the side panniers above though. You can also wear the pod if needed with the addition of a strap. Here's what we currently have in ours. I'm quite a gadgety type of person so I was really excited by the cup holder and tray attachment and the snack tray for Wilf. One of the reasons I was so excited to be testing this stroller is that the Orbit is a built to be eco friendly, the trays are BPA-free and made out of PVC-free polypropylene and the all the fabrics used meet the 'Oeko-Tex standard 100 compliance' . This is a standard that sets limits on almost 200 potentially harmful substances and chemicals. You can find out more about the potentially dangerous substances this standard address here. 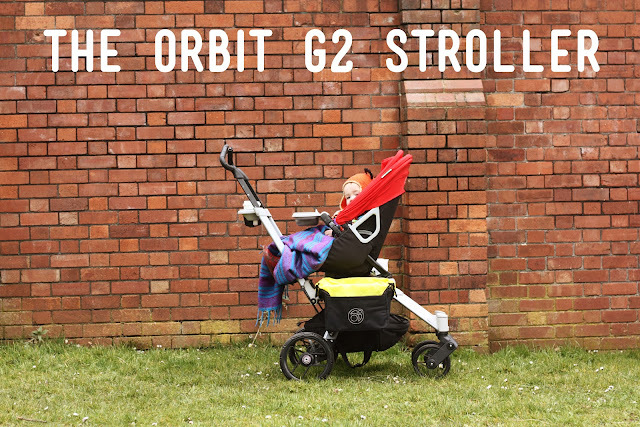 The Orbit is also the worlds first stroller to boast rain shields made from a clear PVC-free material. Within the first half an hour of using the pushchair the man in the bakery, the lady on the train and a lady who recognised me from playgroup all commented on the stroller for different reasons. It certainly does attract people's attention! Whilst my first impressions have been very positive I will be testing how the Orbit fairs in different scenerios and situations and reporting back on my opinion of them. Tom has also agreed to guest post (for the first time!) over here on his opinion, Tom by nature delights in being a bit of a grumpy old man so I'm interested to read his review myself! p.s I had to include this Instagram picture of a recent shopping trip, isn't this just the best biscuit eating face?